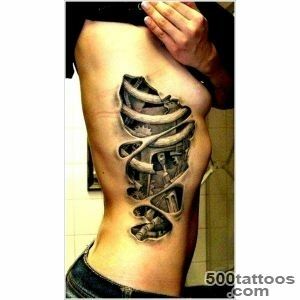 There was a tattoo biomechanics in the 80s in the US, but gained popularity only in the early second century. 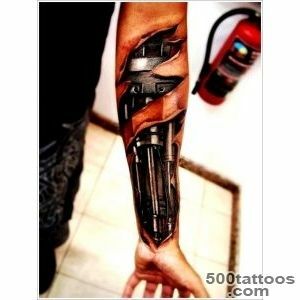 In the new era it came to symbolize the development of man, when life is no longer possible to do without robots, electronics, machinery and other trendy gadgets. 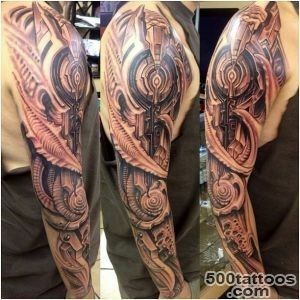 The main implication of this style - this is the greatest potential,reinforced by constant progress. 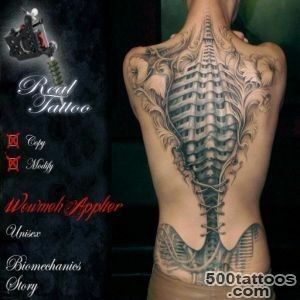 Most tattoos are copying the work of Hans Rudolf Giger, a Swiss artist who worked in the style of " fantastic realism ". 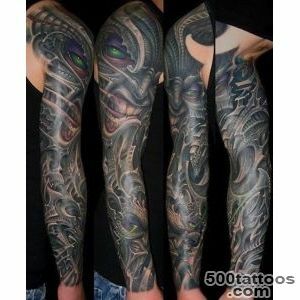 Perhaps, everyone is familiar with his work, because he was involved as a designer in the filming of the cult film "Alien". 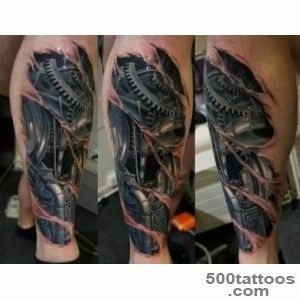 It Giger created the terrifying appearance of aliens. 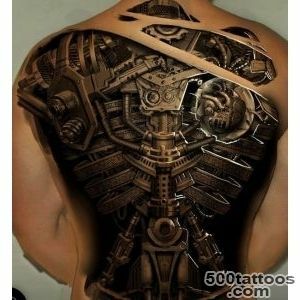 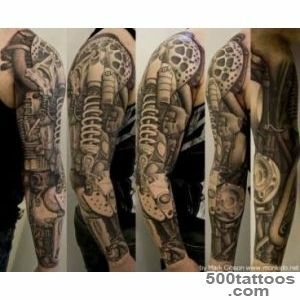 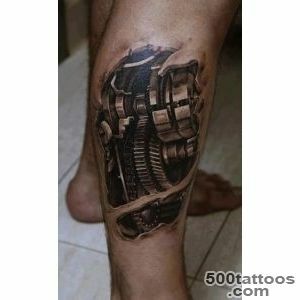 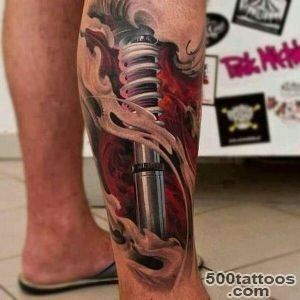 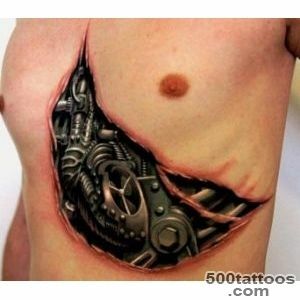 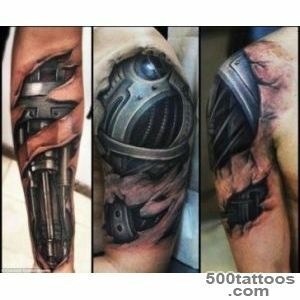 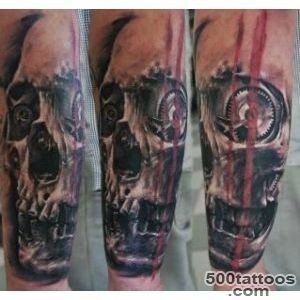 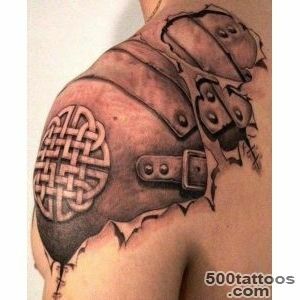 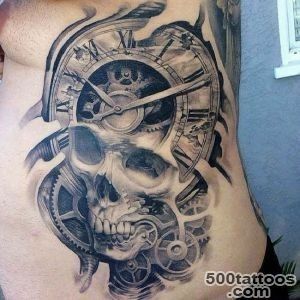 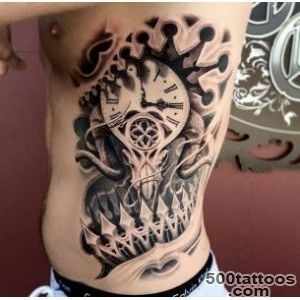 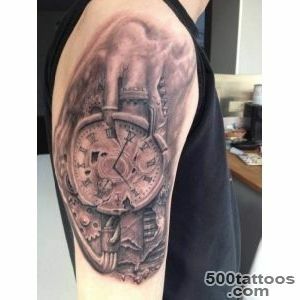 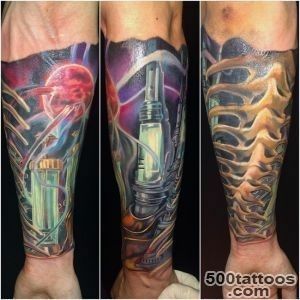 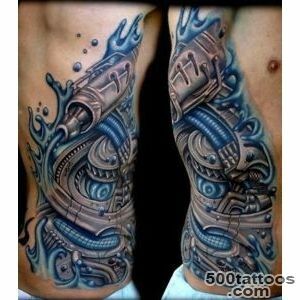 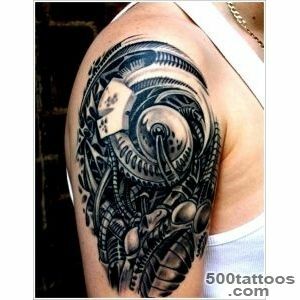 The most popular designs biomechanical tattoos is seen through the torn flesh, the motor part of a mechanism with a complex design. 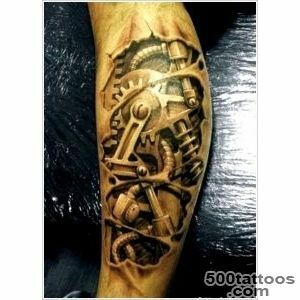 Tattoo biomechanics should look the most realistic, thoroughly traced all the parts ( pistons, nuts, gears, wires, d. Spring, and so on. 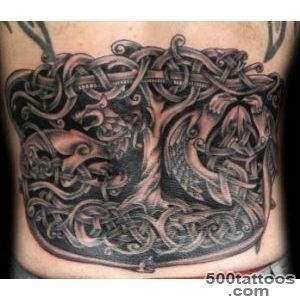 ).Earlier designs were monochrome only in black color with small greyish hues, but now the style evolved. 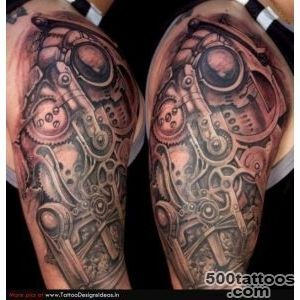 Biomechanical tattoos have become more well developed, complex, voluminous, every, even the smallest detail is carefully outlined. 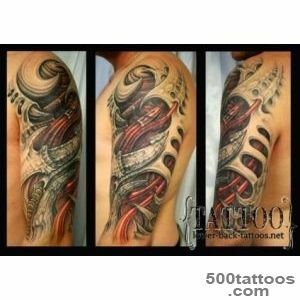 Often this color drawings with sharp transitions tones.Torn flesh became as carefully pick out to get as close to the real wound, visible muscles, tendons, broken bones, which are combined with the mechanics. 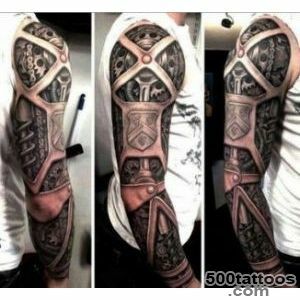 Usually this prick tattoo on his shoulder, this part of the body, it becomes expressive due to the relief of the biceps.On the forearm often painted on the inside, starting from the wrist and ending in the elbow. 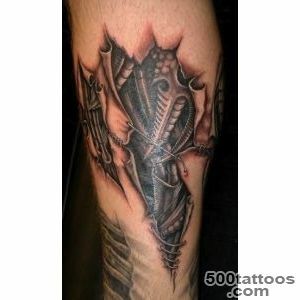 Due to the fact that the hand is constantly in motion, the tattoo becomes dynamic. 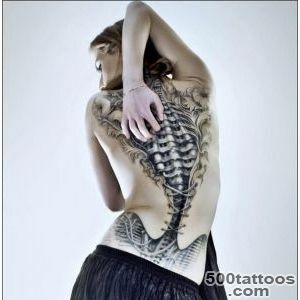 At the foot of preferences on placement of the picture differ by gender. 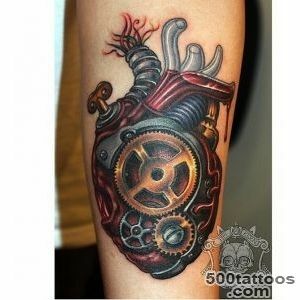 Women choose the thigh, and men - shin.Very stylish looks biomechanical tattoo on his chest that shows the human heart muscle works by mechanics. 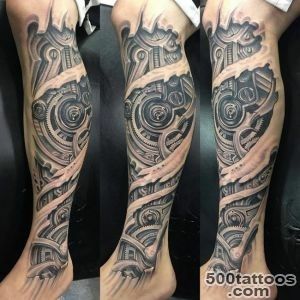 On all continents, in all cultures, no matter how different they may be, in the style of tattoo biomechanics treated as a unity of man and technology.